The European Central Bank has rejected a plan by Dublin to restructure its bank bailout. Any deal needs to balance the risks of derailing Ireland’s recovery against a breach of its own rules by the ECB. For now, low Irish bond yields give Frankfurt an advantage. Ireland and Portugal are slowly regaining market access and may soon be able to ask the ECB to buy their debt. The bank would then have to put its money where its mouth is. But it could use the opportunity to show the benefits of its still-untested programme at a limited cost. Investors are lapping up contingent capital securities in bailed-out banks. Dublin sold on a CoCo from its bank rescue. Belgium’s KBC is issuing the bonds to recapitalise. The boom is helping Ireland and Belgium recoup bailout costs. They should take the money while they can. Privately held Ardagh has grown sevenfold since 2007 through deals bankrolled by high-yield investors. Now the Irish packager is buying a Saint-Gobain unit for $1.7 bln. Debt-funded M&A sprees needn’t end in tears. But Ardagh will one day need the support of equity investors too. Sectarian unrest and a bloated public sector may seem unrelated. But Northern Ireland’s heavy subsidy from London means greater pain under austerity. Cutting corporate tax rates, a la Dublin, could be a game-changer. But fiscal radicalism could also bring nasty side effects. 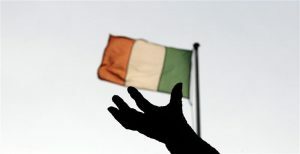 The IMF is urging the euro zone to help Dublin restructure its bank bailout, and warns there are limits to austerity. The Fund is moving to a more pro-active role as bailout partner. With markets slumbering and the crisis abating, Ireland needs all the help it can get. Can Barclays old boys make the Irish play pay? Barclays alumni made millions helping their ex-employer offload subprime assets in 2009. Now they have taken a 17 pct stake in Ireland’s 74 bln euro bad bank. The terms aren’t public. But the arrangement seems to need leverage, or a discount, or both if history is to be repeated with this new punt. Dublin is issuing long-term debt for the first time since the rescue of 2010. The funding is likely to be pricey. But if the deal gets sold, it will show that bailouts needn’t be forever, or end in default. With Spain and Italy on the brink, euro zone partners will be thankful. Last week’s euro summit dangled a big carrot: that Dublin’s punishing bank bailout which brought the country to its knees may be rejigged. Irish bond yields are now as low as Spain’s. But much detail needs to be agreed, leaving scope for disappointment. Dublin is trumpeting the fact that it has been allowed to make a 3.06 bln euro injection into its banks with a long-term bond rather than cash. But the elaborate arrangement actually delays the problem by just a year - and the wider issue is, as yet, no nearer to being solved. Ireland is trying to restructure the fearfully complex promissory notes it issued to bail out its banks. Ideally, it would like to hang onto 31 billion euros of cheap Eurosystem money for 30 years. While that’s too much to expect, there should be scope for compromise. The debt-laden Irish telco’s last owner walked away, and an auction’s unlikely to find a new one. A $2 bln debt bonfire beckons, which would leave top-ranking lenders in control. Depressed valuations across the sector suggest junior creditors will struggle to salvage anything. Many bond investors have missed the best trade of 2012 so far. Italian 10-year government debt gained 8 pct in January while many managers were wary. Rather than chase prices higher, those who missed the boat may find more value in other corners of the euro zone periphery. Greece is defaulting, Portugal may follow, but Ireland is raising funds. Dublin’s 3.5 bln euro bond swap eases fears of a liquidity crunch and will help the country return to markets during its IMF programme. It’s a step closer to normality for Ireland, and Europe. Ireland is meeting its fiscal targets, but a slowing economy means it may need more help. One possible solution would be for the euro bailout fund to take on some 31 billion euros of IOUs Dublin gave its banks. A hard sell, but Europe needs a bailout success story. S&P’s downgrade of the country’s AAA rating does not reflect problems in the economy. The current account is in surplus and deficit and debt levels moderate. But Austria’s banks peddled unsound foreign currency mortgages at home and abroad. The country is paying the price. There is a crying need to distinguish between fiscal austerity and structural reform. The endless austerity programmes adopted by the GIIPS could spiral out of control. By contrast, structural reform could make them dynamic. Despite several years of austerity, the country has announced more cuts. Next year’s budget deficit is still forecast at a huge 8.6 percent of GDP. Ireland has adjusted rapidly and its industry is competitive. But it may still need more support from the euro zone and IMF. The fear and uncertainty over Europe has sent the cost of U.S. credit skyward. By one closely watched gauge, junk bonds are yielding almost five percentage points more than they reasonably should. Given the bureaucratic dithering, bankers and buyout barons may be idle for a while.